From Nollywood actresses to afrobeat superstars, August Udoh, has captured them all. He's lauded as Nigeria's most talented celebrity photographer but it is the stories of those on the very margins of society that are important to him. The fighters captured in series "Dambe" are ordinary working men. "They have normal jobs. Some are truck drivers, others mechanics," Udoh told CNN. But with one exception - their downtime is spent competing in martial arts sport dambe. It's a traditional form of boxing where competitors fight with a single bounded hand for three rounds. As Udoh's series title suggests, this martial arts club is underground, its presence spread only through word-of-mouth. "I had a security guard from the north who was talking about it and he showed me a video posted online," says Udoh. "I thought this is actually true - there is an underground fighting club that a lot of people in Nigeria don't know about." Dambe's history stems from the Hausa people in northern Nigeria and is thought to date back centuries. It was local butchers by trade who competed. The stronger punching hand known as the spear is traditionally tied with cotton and rope, while the other hand shields against opponent's punches. Contestants can also kick - the fight ends when an opponent falls to the ground - referred to as a "kill". Traditionally the cloth bound hand was dipped in resin and covered in shards of glass - this has been banned. Boxing gloves were introduced in some areas to make the sport safer. But many still consider it a brutal sport due to the injuries inflicted. 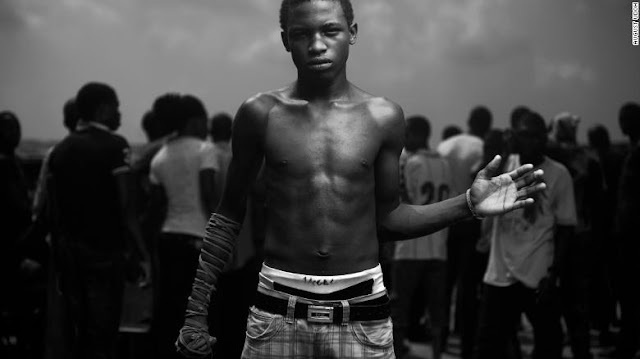 While Udoh's images present the raw, unfettered energy of the art's young competitors, dambe is a poor man's sport. Fighters are almost certainly low income earners. For them it's a chance to make money explains Udoh. Tickets for fights are often sold at around 500 Naira ($1.38) per person. "Usually the fight organizers make 50,000 Naira ($137) a day." "As a fighter - champions earn a lot," Udoh said. "If you've won a lot of fights then you get paid more. There is a hierarchy thing where you attract high fees because you bring in the crowd." Gifts are also given by fans. "People send money back to their parents, one fighter was given a house." Udoh spent a week traveling around Niger and Ogun states talking to the boxers who compete. The photographs raise questions on the widening regional inequalities within the country - which has been widely criticized by humanitarian groups. Those living in often wealthier states in the south have no concept of how their northern neighbors live explains Udoh. "I have friends who have not been out of Lagos since they were born - so they don't know." "People don't realize every other state is not like Lagos," he adds. The photographs are about shedding light upon such regional disparities Udoh explains. In 2012, he spent a month traveling around Kogi to capture the country's flood victims. "I slept in [my] car for a month to take their pictures, there was nowhere to sleep" says Udoh. "I really felt their pain but there was nothing I could do." Nigeria's recent September floods has killed nearly 200 people in the country and displaced around 176,000, according to Nigeria's Emergency Management Agency. Udoh notes the power of his images stem from the stories behind them. He adds: "I want to convince people to look outside of Lagos by telling these stories with my pictures."